How do I completely uninstall Setapp and it's helpers manually? The Setapp.app helper missed my first attempt to Trash the app (maybe an earlier version?). So I need to clean out it's various helpers and plugins manually. If I delete all the above will that completely remove Setapp? If not, what else do I need to do? 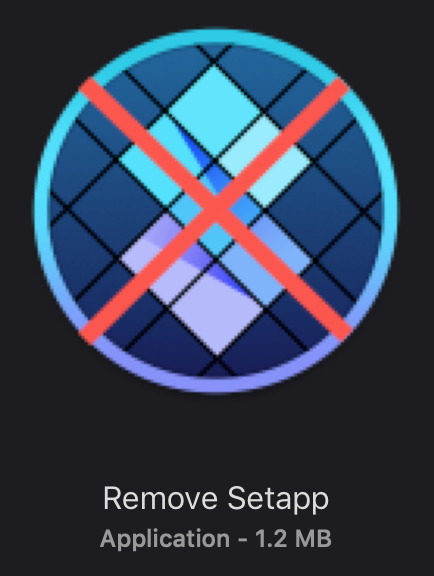 If you did not undo it in this way, you must use the "Remove Setapp" tool that is delivered to you in the support. Setapp is absolutely brutal to get rid of. Even if you think you've uninstalled it, lingering Setapp demons will continue to hijack independent processes and legitimately purchased apps (like Gemini 2, in my case) and try to subsume them under the Setapp environment which isn't even supposed to exist any longer. The "Complete Uninstall" option does not remove SetappQL.qlgenerator or the com.setapp.DesktopClient.SetappAgent.FinderSyncExt folder. JUST went through the list in the first answer after doing a "fresh uninstall". I've used AppCleaner (https://freemacsoft.net/appcleaner/) for ages now with great results. You just open AppCleaner and then drop the app to be cleaned to the AppCleaner's window and it returns with a handy list of files related. From there trashing them is just a click away. Hope it helps. Not the answer you're looking for? Browse other questions tagged macos applications uninstall . How do I manually uninstall the Developer Tools? How do I uninstall an iOS app completely? How can I completely uninstall DisplayLink? How to manually uninstall Adium completely from Mac OS X? How do I uninstall Setapp when iStat is running? How Would I Manually Uninstall Search Encrypt On My MacBook?